Diabetes – a medical condition that has reached epic proportions in the United States. According to the American Diabetes Association, there are more than 25 million people living with diabetes, while about one third of those people are unaware that they are diabetic. There are another 79 million people are pre-diabetic. This means that if they don’t make some healthy changes in their lives, they will develop diabetes. 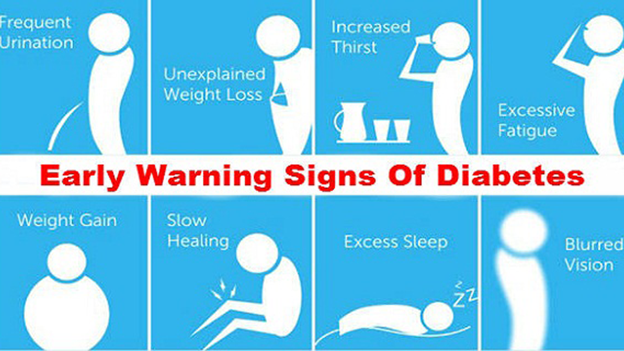 Today, we’ll give you 10 early warning signs of diabetes. As glucose levels in the blood rise, the kidneys attempt to filter it from your blood.The kidneys can’t keep up when there’s too much glucose in the blood. As a result, the excess glucose is excreted into the urine along with fluids from the body. And as your body attempts to expel the glucose, more frequent urination can be expected. This leads to chronic dehydration, and as a result, you’ll feel the urge to drink more. In order to pull glucose into your cells, your body needs to utilize insulin. If you’re insulin resistant, or you just have a lack of insulin, your body can’t store the glucose in your cells. And the cells need this glucose for energy. As a result, your body doesn’t have the energy it needs. This leads to increased hunger as the body’s attempt to increase calories for energy. Weakness and fatigue, along with increased hunger, are a result of the body’s inability to properly utilize energy (glucose).The body, not being able to pull glucose into the cells, doesn’t have the proper amount of energy to function optimally. This results in fatigue and weakness. When your body is excreting excess glucose when you’re eating, it’s not storing it as energy for later. What it does is, it excretes the glucose in urine and decreases the amount of calories that are being absorbed into the cells. As a result, you end up losing weight, because you can’t compensate in calories for what is lost. Tingling or numbness is known as diabetic neuropathy. It’s the damage to the nerves that arises as a complication of high blood glucose levels.When blood glucose levels are elevated, it interferes with signals transmitted by nerves.Furthermore, the walls of the small blood vessels are weakened. This leads to cutting off blood supply to nerves, in the outermost extremities, starting with the feet. The eyes are also extremely sensitive to the effects of high blood glucose. The lenses can swell and change shape, causing your vision to suddenly become blurry. According to a study conducted by the University of Warwick, receptors that recognize infection become ‘blind’ when glucose levels blood rise.The high glucose effectively inhibits the normal working process of the immune system. As a result, the work of white blood cells is slowed down, and along with it, the normal healing process. Frequent infections can be another symptom brought about by the increase blood glucose levels. A slowed immune response can lead you to an increased likelihood of frequent infections, and worse infections that a person with stable or normal blood glucose levels. As we all know, our body is made up of anywhere from 50%-78% water. And due to the frequent urination and perpetual state of thirst, our body is literally drying out. That includes our skin. So, as you can imagine, dry, itchy or scaly skin is a common symptom of diabetes as your kidneys excrete more water out of your tissues. Feeling irritated, hunger and low on energy can all be attributed to the expelling of energy supposed for storage in the cells. This results in an overall bad feeling and the irritability of being in a perpetual state of lost energy.